Bromelain is a protein-digesting enzyme derived from real pineapples. It is extremely beneficial to reduce inflammation and pain, support digestive health, promote nutrient absorption and faster recovery. 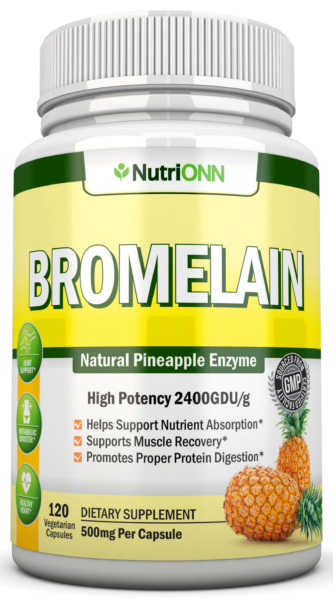 Bromelain is a protein-digesting enzyme extract derived from pineapples. This is the compound that makes your mouth sore after eating a pineapple or drinking pineapple juice. Because of its high bromelain content, pineapples have been used in South and Central America as a natural way to support health for centuries. Bromelain is commonly used to support digestive health, promote proper nutrient absorption and healthy body weight. Its properties may help reduce inflammation and joint pain, support faster recovery, and relieve sinus infections and allergies. Helps relieve the symptoms of sinus infections, cough and allergies. All NutriONN supplements are manufactured right here in the U.S.A in a GMP-compliant facility. Our labs are FDA-inspected. We provide you with the highest quality pure Bromelain without any artificial ingredients.